Lieutenant Barclay, while facing his fears over the transporter, sees something alive in the matter stream. I'd probably be afraid to get into a transporter as well. It's the metaphysical implications that trip me up: how could I be sure that the person who reappears on the other side is actually me and that I won't simply cease to exist as myself as soon as I am disassembled at the molecular level? Spiders bother me. I hate the buggers. Ferrets, too, although that's more logical attrition than irrational phobia. If I could rid the world of spiders and ferrets, I would without hesitation, damn the consequences. I like that you have a good character interaction between two recurring guest characters in Barclay and O'Brien. They have a natural camraderie because they are not in the ship's main clique. Riker being friendly to Barclay after he beams over is nice, but it seems a little out of character. In the past, Riker has shown little patience for the personal problems of junior officers, Barclay in particular. Then again, maybe he was just having a good day. It's interesting that we're given a peek at some larger intrigue going on with the Cardassians, even though it amounts to nothing within the context of the episode itself. Seeds are being planted for something bigger later on, now that the Klingon and Romulan story arcs seem to have run their course. La Forge says nothing out of the ordinary has ever happened to him during transport. Is he forgetting "The Next Phase," in which he and Ro phased out of normal matter for a few hours and thought they might be dead? It was only a couple of episodes ago. How could you see anything in the matter stream, when your eyes and brain are in the process of being ripped apart and put back together again? I always assumed you would black out during the process. The "thing" in the matter stream reminds me of TOS' "The Doomsday Machine." O'Brien insists that transporter accidents are rare and that none have occurred on his watch. Indeed, up to this point in all of Star Trek, the only transporter accident resulting in a fatality is in Star Trek: The Motion Picture. 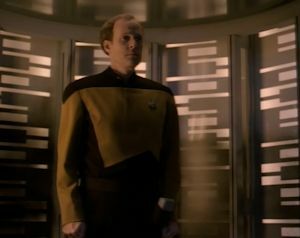 I love the scene with Barclay asking the computer about transporter psychosis. Anybody who's ever had a moment of hypochondria and spent a few minutes on WebMD can relate to it. I know, narratively-speaking, it makes sense to have Barclay face his fears through immersion (just as O'Brien had to deal with the spiders), but why not offer to put Barclay to sleep while they do the transport experiment to weed out the "microbes" in his body? There's no reason he has to be awake, is there? In fact, since O'Brien says it would be best if he didn't move around too much, wouldn't the whole thing be easier with him asleep? Barclay episodes are always fun, and this one yet again uses him as an everyman, as somebody more easily relatable than the regular crew. It even develops him a little by eventually showing that his confidence has grown--the Barclay we meet in "Hollow Pursuits" would never have the guts to wake the senior staff, admit the embarassing truth that he thought he had transporter psychosis, and then insist he's not crazy--and the people around him no longer share knowing glances and act like they all think he's lost his mind. If anything, they show a remarkable amount of faith in him, and the episode doesn't waste a single minute retreading the "nobody believes Barclay" trope. The plot manages to cover very human subject matter in how it deals with a phobia. It's a thinly-veiled allegory about a fear of flying, and it's reminiscent of the classic Twilight Zone episode in which William Shatner sees a gremlin on the wing of an airplane. Still, much of the puzzle relies on esoteric technobabble and a willingness not to think too much about how the transporter actually works, not to mention the fact that a fear of transporters has already been pretty well explored by Dr. McCoy; it's one of his defining characteristics. It's also a little too fitting that the one guy who has a transporter phobia just happens to be the only guy to experience something weird on the transporter pad.